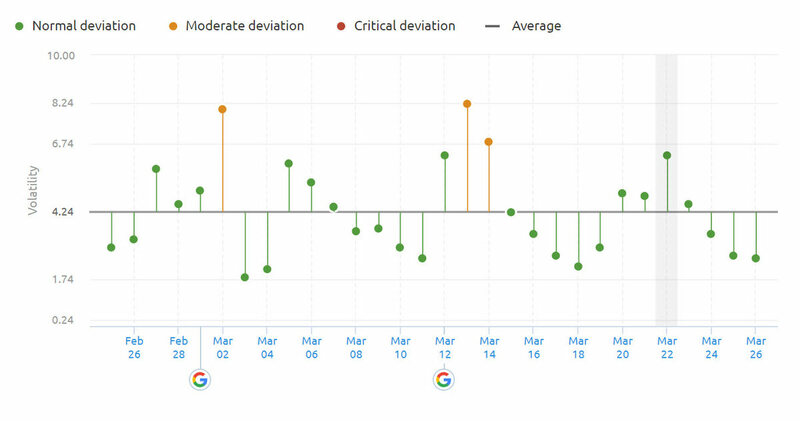 There has been increased volatility in the SERPS indicating a further Google Algorithm Update between the 20th and 23rd of March 2019. Published: Mar 26, 2019. 13:18 UTC. There has been increased volatility in the SERPS indicating a further Google Algorithm Update between the 20th and 23rd of March 2019. It is possible that it is related to the earlier 12th March Update, but I cannot be 100% sure. Google has previously said that Core Algorithm Update may take a week or more to roll out, so it is very feasible that this is not a separate update. I have recently updated my article on the “March 2019 Core Update”, so if you are experiencing a change in Traffic or Rankings, I recommend you check that out. I’ll be keeping this article reasonably short, with just a summary of the SERP Trackers, who the update affects, and a look at comments in the SEO community. The SEMrush Sensor shows the update commencing on the 20th of March and continuing through to the 23rd of March. SEMrush Sensor 20th of March 2019 in the US. © SEMrush. The Rank Risk Index tracker shows a much smaller update than what the SEMrush Sensor shows. Rank Ranger Risk Index 20th of March 2019. © Rank Ranger. The MozCast weather report shows increased volatility commencing on the 19th March, continuing to the 21st. Mozcast 20th of March 2019. © Moz. The Algoroo report again shows volatility between the 20th and 23rd. Algoroo 20th of March 2019. © Algaroo. The SERPMetrics report similar volatility to the SEMrush Sensor. SERPMetrics 20th of March 2019. © SERPMetrics. SEMrush Sensor Deviation of Categories 22nd of March 2019. © SEMrush. It would appear that Finance, Autos & Vehicles, Health, and Jobs & Education queries were most affected. While Google does not target individual sectors, the types of queries an update targets could go hand-in-hand with specific industries. For instance, Finance and Health were hit hard by the E-A-T updates, which targeted whether a site had the necessary Experience, Authority, and Trust. It looks like these sectors were affected by this update, and while no-one can be certain if it is E-A-T-related, it might be something you want to consider. Get backlinks from high-authority (high E-A-T score) websites in the industry. Ensure you have detailed author bios detailing those qualifications. I have had a location-based travel-ish content site for the last 6 or 7 years. From the outset, my traffic steadily increased and it seemed like it came up as the top search result when you searched for almost anything related to my niche. Then, around June last year, traffic slowed down and kept dropping. I was down 40% or so YoY and the first weeks of March were the lowest yet, probably 50% of the traffic I had last year. Things got better after a pretty poor start to March for the website I work on from Thursday last week.